The groundbreaking information presented in this workshop is the result of Sharon’s inquiry into the fascial plasticity of bone. There are two major areas of study in this workshop: Bone Change and Bone Rolling. The workshop will be 5 days in length (9:00-5:00, with a lunch break). Since the initial spontaneous discovery in 1973, Sharon has been exploring the curious phenomenon of Bone Change. These techniques are designed to address shape and contour. Bone Change employs precisely placed manual pressure into the fascial elements of the bone. The chronic distortions left over from badly healed breaks in the bone, or scars in the bone, transform towards normal in moments. Results appear to be permanent. Accidents and injuries can disorganize the functional relationships between bones. Bones can get stuck together out of place causing chronic dysfunction. These bone- to-bone adhesions are at the level of the fascia of the periosteum. In Bone Rolling, deep manual pressure is precisely directed through the periosteal adhesion to release the stuck bones. The bones are now free to move, or "roll" into a better relationship within structure of the fascial web. There are Bone Rolling techniques for most of the bone-to-bone relationships of the body. The techniques are primarily for the appendicular skeleton, and some for the axial skeleton. Bone Rolling results in profound, lasting structural shifts. Sharon will also demonstrate "Two-Handed Torque" for the cranium. This fascinating and unique approach smoothes out irregularities in the cranium, nicely demonstrating the fascial plasticity of spongy bone. Sharon Wheeler trained in 1970 with Dr Ida P. Rolf, the founder of Structural Integration, when she was 23 years old. Her contributions to the field are a reflection of her lineage. 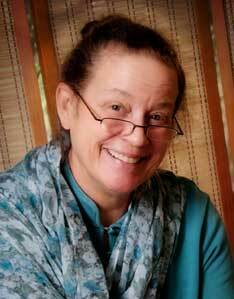 Sharon was on staff at Esalen Institute in Big Sur, California teaching Esalen Massage when she met Dr. Rolf. She took her audit and practition in the two Big Sur River House classes in 1970. She trained in the first Rolf Movement Integration class with Judith Aston in 1971. In 1973 Sharon did a second practitioner class with Dr. Rolf in the Adam’s House at Esalen, and did the Philadelphia Advanced Training with Dr. Rolf in 1978. Sharon was one of the youngest students as well as one of the few women to be trained. Among the students in her class were two MDs, an aero-space engineer, and a PhD psychologist. Sharon was one of Dr. Rolf's admitted "artistic experiments." Sharon's membership affiliations include Guild for Structural Integration, Rolf Institute for Structural Integration, International Association for Structural Integration, Fascia Research Society, and NCBTMB workshop provider. She maintains a practice in Rolfing Structural Integration and Rolf Movement in Port Orchard WA and teaches continuing education workshops on ScarWork, BoneWork, CranialWork, and the Art of Structural Integration. The cost for registration for this 5 day course is $750. Please pay in full to register.